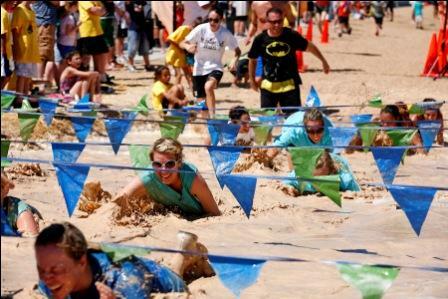 Mad Mud Run Draws Hundreds To Providence! Belly crawl? Costume contest? Mud pit? It must be the second annual Mad Mud Run at Providence! And this race is no joke, with over 650 participants raising more than $3,000 for Spread the Word Nevada. 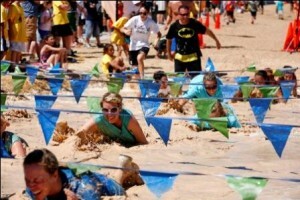 All the fun took place last weekend, when competitors donned their capes and tutus to run a 4.5 miles race and mud obstacle course; while spectators armed themselves with super soakers and squirt guns! Splash zones, hay bales, water walls, balance beams and tire arrays made up the course. Kids also had their chance to compete in the 100-meter Mudpuppy Splash, which ended in (of course!) a 40-foot mud pit. Later, everyone enjoyed entertainment booths, volleyball, soccer and park games. Awards for top finishers and best costumes topped off the festivities. To learn more, CLICK HERE to watch Jenna Bell, our CCMC lifestyle director at Providence, discuss the event on the local Las Vegas FOX news. We salute all the weekend warriors who were willing to get dirty for such an excellent cause!